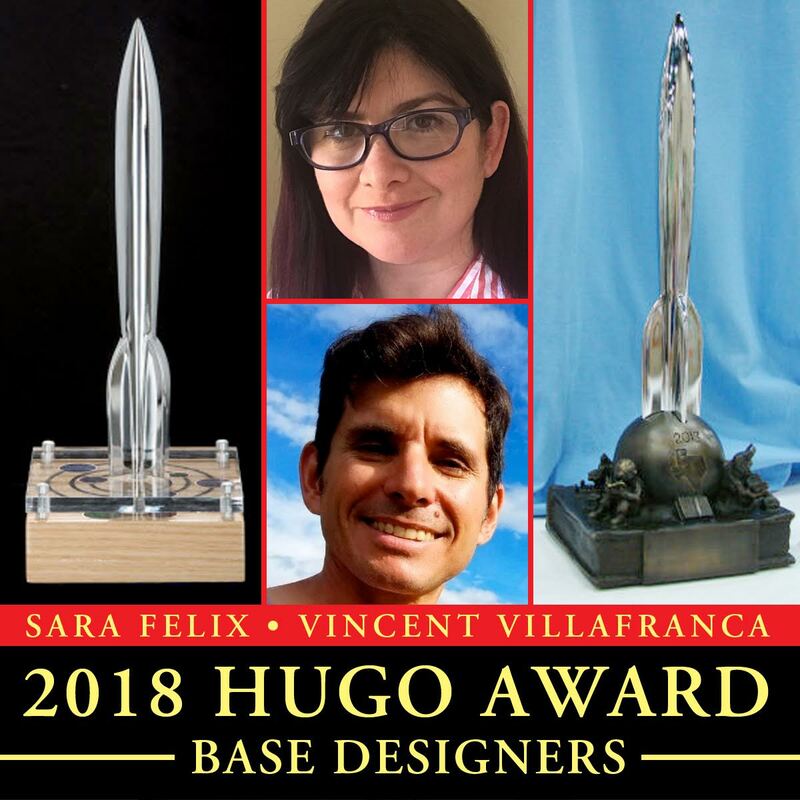 This entry was posted in Awards, SF & Fantasy Art, Worldcon and tagged Hugo Awards, Hugo base design, Kevin Roche, Retro-Hugos, Sara Felix, Vincent Villafranca, Worldcon 76 by Mike Glyer. Bookmark the permalink. Okay, that’s interesting. Have any artists repeated before? I like the idea of a new designer each year, though to forestall the obvious: yes, two people collaborating is somewhat different. Have any Worldcon chairs designed Hugo award bases before? I couldn’t find a list. 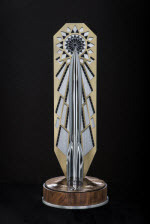 The Wikipedia page doesn’t link to a page just about the based or have a list of designers, and while thehugoawards.org has a page about the trophy and links to pictures that appear to have credits, the idea of clicking through 70 or however many times and taking notes makes me think . . . ye gods, someone must have a list already?!?!?! Kendall: Have any artists repeated before? Deb Kosiba designed the bases for the 2012, 2006, and 2005 Hugo Awards. Marina Gélineau designed the 2011 Hugo base and the 1939 Retro Hugo base (which was given in 2014). Johnna Klukas designed the 2000 and 2001 bases. Kendall: Have any Worldcon chairs designed Hugo award bases before? They have, but it was back when the bases were pretty basic — rectangular pedestals or truncated pyramids. Note exactly, but I was Deputy Chair of ConAdian, the 1994 Worldcon, when my basic design for what became the 1994 Hugo Award trophy base was fleshed out by Janet Moe (who actually did the laser cutting of the base from Canadian maple wood) and Jeff Berry and enhanced by the addition of the “space metal” plates (salvage from Canadian sounding rockets, visible in the photo as the maple-leaf-shaped plates) from Stan Philippon. Kevin S, very elegant! I had forgotten that one. If there was one Hugo base that I could own for my very own self it would be the Retro Hugo base from MidAmeriCon II. That thing was gorgeous and makes me want to build a time machine JUST to go back in time and write a Hugo-worthy story. @JJ & @Kevin Standles: Groovy and thanks for the info!